Learn from an expert while you become the expert. This video is designed to teach Exchange Server administrators (and aspiring Exchange Server admins) how to work with Exchange Server 2016. This video series covers deployment, upgrade, architecture, and day-to-day administration. This video series is designed to provide hands-on training for several common Exchange Server-related tasks. The video demonstrates procedures for both brand new Exchange Server deployments, and for bringing Exchange Server 2016 into an existing Exchange Server organization. Some of the other topics covered include upgrades and migrations, creating a hybrid Exchange Server deployment using Office 365, security and compliance, fault tolerance, and basic day-to-day management. Brien Posey is a 14-time Microsoft MVP and has worked full time as a tech author and speaker since 2000. Brien has worked in IT since the early 1990s and as a network administrator for some of the largest insurance companies in America. He has also worked as a network engineer for the U.S. Department of Defense at Fort Knox, and as a CIO for a national chain of hospitals and healthcare facilities. He is currently working/training as a commercial scientist astronaut. ◦A secondary audience is probably those who want to host their corporate e-mail on Office 365. Lesson 1 begins by discussing what Exchange Server is, for the benefit of those who might not be familiar with Exchange Server. For those who have used Exchange Server before, this lesson also discusses new features, discontinued features, and architectural changes. Lesson 2 guides you through the process of deploying Exchange Server. This lesson walks you through the process of preparing your Active Directory and installing both Exchange 2016 roles. It also discusses the various administrative tools you will be using. 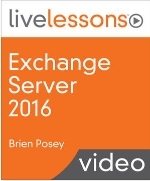 Lesson 3 discusses the basics of working with Exchange Server 2016. Here you learn how to perform common tasks, such as creating mailboxes and groups. Lesson 4 is an introduction to mailbox clients. This lesson discusses Outlook on the Web, Outlook 2016, and Office 2016 Mobile. Lesson 5 focuses on securing your Exchange Server. In this lesson, you learn how to replace Exchange’s self-signed certificates with SSL certificates that have been issued by a certificate authority. You also learn how to leverage role-based access control for the assignment of permissions. Lesson 6 discusses message hygiene. This lesson is where you learn how to protect your Exchange mailboxes from spam and viruses. Lesson 7 is all about mobile messaging. In this lesson, you learn how to make Exchange Server resources available to users on their mobile devices. Lesson 8 is an important lesson for anyone who wants to add Exchange Server 2016 to an existing Exchange Server organization. You learn about prerequisites and about how to deploy Exchange 2016 into your existing environment. Lesson 9 is designed to help those who want to migrate from Exchange Server 2013 to Exchange Server 2016. In this lesson, you learn how to migrate mailboxes and public folders, and how to de-provision Exchange 2013. Lesson 10 focuses on database availability groups. The lesson explains what database availability groups are, and then walks you through creating a database availability group and managing database copies. You also learn what happens in the event of a database failover. Lesson 11 is all about Exchange Server 2016’s compliance features. This lesson covers features such as transport rules, in-place hold, eDiscovery, data loss prevention, logging, and auditing. Lesson 12 is designed to help you meet your message retention requirements. In this lesson, you learn about two message retention related features: the journal and archive mailboxes. Lesson 13 teaches you how to link your Exchange Server organization to Microsoft Office 365. You learn how the subscription process works, and how to register your domain name for use with Office 365. You also learn how to migrate Exchange Server mailboxes to Office 365. Lesson 14 wraps up the video series by discussing helpful diagnostic tools. The tools discussed include the Connectivity Analyzer, Exchange Deployment Assistant, Best Practices Analyzer, and various PowerShell cmdlets.